The NEXTCAR team in Purdue's Herrick Lab. From left: Neera Jain, assistant professor of mechanical engineering; Greg Shaver, professor of mechanical engineering and principal investigator; Dan DeLaurentis, professor of aeronautics and astronautics; Srinivas Peeta, the Jack and Kay Hockema Professor in Civil Engineering; and Shaoshuai Mou, assistant professor of aeronautics and astronautics. 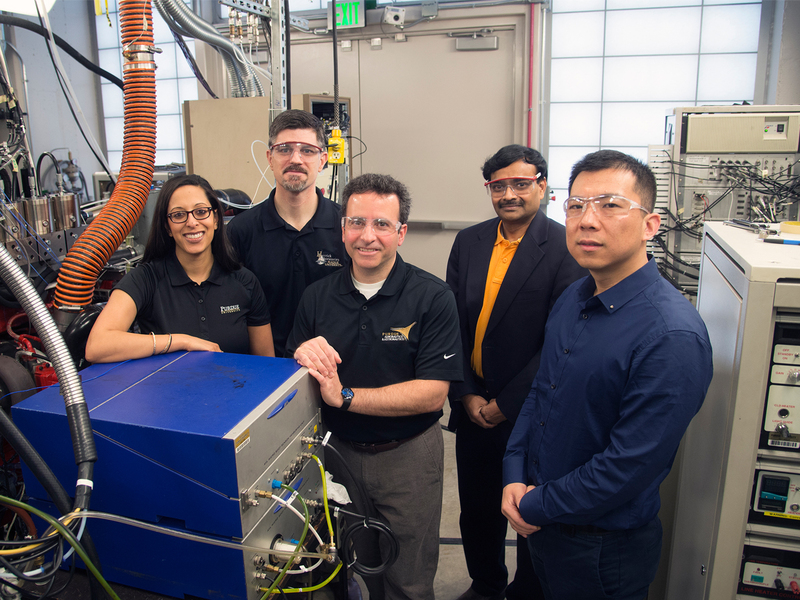 Partnerships ensure the future of freight Purdue engineers team with trucking industry partners to reduce fuel costs and automate over-the-road shipping. Purdue engineers team with trucking industry partners to reduce fuel costs and automate over-the-road shipping. The average highway driver might see a pair of tailgating semi-trucks and fear that the worst is about to happen. But freight companies, truck makers and Purdue engineers see something different. One truck following fractions of a second behind another contributes to much better fuel economy. And a complex series of controllers, sensors and cameras may soon be ensuring the second-by-second safety of the convoy. That’s the goal of a U.S. Department of Energy Advanced Research Projects Agency-Energy (ARPA-E) program that aims to reduce vehicle fuel consumption by 20 percent. It’s called the Next-Generation Energy Technologies for Connected and Automated On-Road Vehicles, or NEXTCAR, project. For the three-year effort, Purdue and its industry partners — Cummins Inc., Peloton Technology, Peterbilt Motors Co., the National Renewable Energy Laboratory and ZF TRW — are focused on Class-8 trucks, the 18-wheelers that haul freight. The DOE reports that trucks are responsible for hauling 80 percent of goods in the country, using 28 billion gallons of fuel a year. Efficiency advancements could save companies money and significantly cut carbon emissions. Fuel accounted for about 25 percent of costs for freight-moving vehicles in 2015, according to the American Transportation Research Institute. Creating platoons in which the lead vehicle reduces wind resistance for others can significantly increase fuel economy, but it will take complex calculations to ensure the trucks work in synchrony. The NEXTCAR partnership between Purdue and industry builds off the SuperTruck I and SuperTruck II programs, in which Purdue is a partner. These DOE-funded projects pair academia and industry to develop significant improvements in fuel and freight efficiency in semi-trucks. 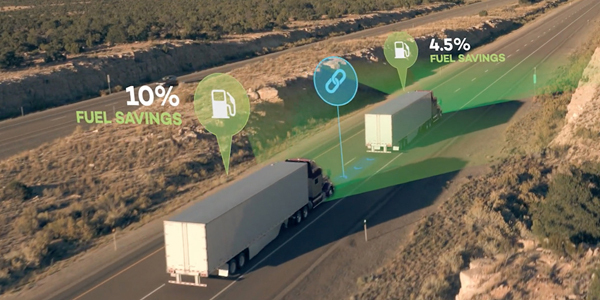 To achieve the type of fuel savings hoped for through NEXTCAR, however, technology will have to advance far beyond simply allowing trucks to follow more closely. Purdue engineers will develop tools and algorithms that will take into account upcoming weather, terrain and traffic patterns, as well as weight and powertrain differences between the trucks, to determine optimal speeds and driving strategies. For their part, industry engineers will help guide the work to ensure that it’s commercially viable. The NEXTCAR work helps companies build on automation work they’re already doing, with the added benefit of the input of faculty researchers, staff and students who are at the cutting edge of their fields. 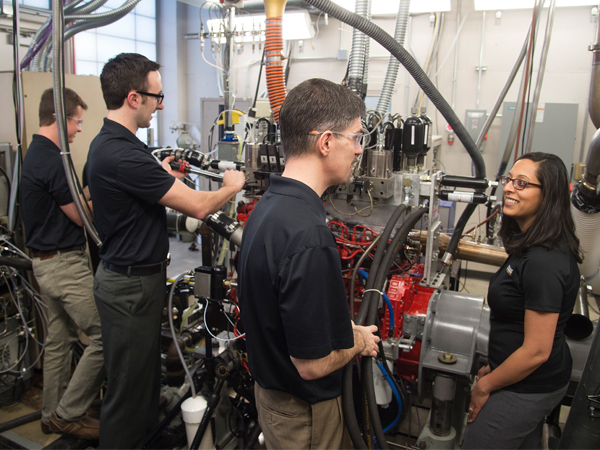 Right: Professors Greg Shaver and Neera Jain discuss engine tests. Left: PhD students Cody Allen and Alex Taylor help maintain testing equipment. Bill Kahn, a principal engineer at Peterbilt, says this type of technology comes to life only when the right partners are in the room. Academic research brings cutting-edge science to the table, while industry partners are able to guide the project in a way that ensures that the final product is usable and cost-effective. “We have a lot of engineers just to support the basic engineering on our trucks, and controlling emissions is the focus of our design efforts. Having the University do the research and show us what’s possible will definitely help cut down the time,” Kahn says. Kahn points to the wide array of disciplines Purdue brings to the team. Faculty researchers come from mechanical engineering, aeronautics and astronautics, and civil engineering. For Purdue’s Neera Jain, an assistant professor of mechanical engineering, working with industry partners is an opportunity to see her work applied. Adaptive cruise control currently installed in some trucks allows those vehicles to maintain speeds and distances from other vehicles, but not within the close proximity the NEXTCAR project targets. Communication is the key to closing the gap safely and maximizing fuel efficiency. A truck’s components, the controllers that make adjustments in the engine and to the transmission, for example, need to communicate with each other. And trucks grouped on a highway need to speak to each other. In today’s trucks, there are many individual decision-making components at work, and they were developed independently of one another, Purdue’s Shaver says. “These new control strategies need to be developed together. The dynamics of how these systems respond will be coupled, and we need to directly take that into account when we develop the algorithms for the vehicle, transmission and engine." Purdue’s Jain is working toward that first goal. She wants to optimize a single truck’s efficiency by developing algorithms that take into consideration how one decision, such as acceleration to move up a hill, affects other truck subcomponents, such as the truck’s heating and ventilation. Communication between and among trucks, down to the fraction of a second, will be key to decreasing the distance between vehicles. Although there will be drivers in the cabs, they’ll be monitoring systems and steering, rather than pressing the clutch, brake or acceleration pedals. Algorithms will take into account everything, including the weight of the trucks, their aerodynamics and differences in their powertrain components. When the lead truck starts to brake, the followers will need to do so simultaneously, but possibly with more or less force. “We may reduce this type of distance to 0.3 seconds. If you drive 70 mph, the distance between the cars might be 9.3 meters,” says Shaoshuai Mou, an assistant professor of aeronautics and astronautics at Purdue. On top of that, the vehicles will have to adjust at a moment’s notice to the unpredictable movements of other vehicles on the road or changes in traffic patterns. Those complex calculations require significant computing power, and equipment required to do so on board would be costly. One of the project’s goals is to keep the cost of implementing the technology under $3,000 per truck. To keep the cost low, calculations from real-time information from each truck and from data collected on upcoming weather and traffic patterns, as well as change in terrain, will be done in the cloud — with decisions based on those calculations sent down to the trucks. In theory, despite what seems like a potentially unsafe situation — a truck trailing another by just two car lengths — sensors and high-tech communication will ensure that the trucks are not only saving money, but traveling safely. This video illustrates the practical applications for platooning trucks.